Earlier this month, Commissioner of Education, Dr. Freddie Evans stated: “The school has experienced an infestation of bird mites due to birds nesting in the roof space. 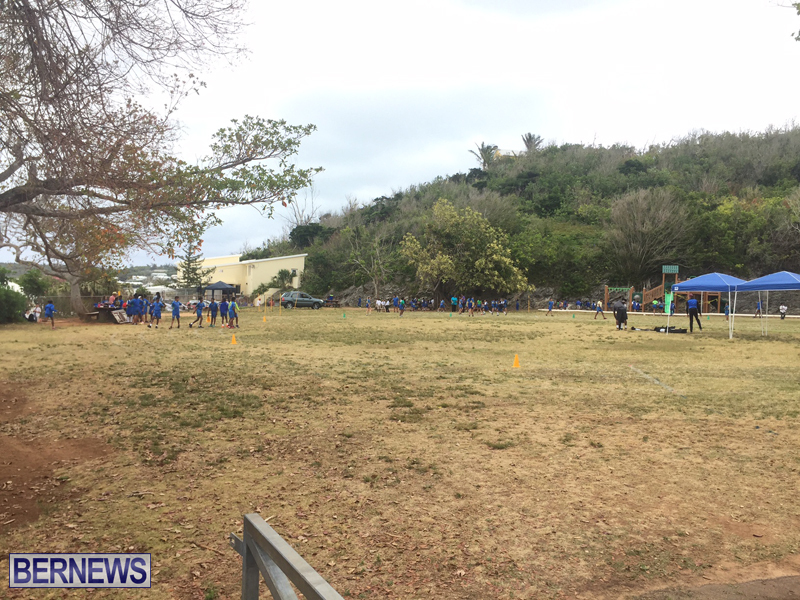 Speaking with us at the school today, Shannon James from the Bermuda Union of Teachers said, “As you know, the school was closed last week Monday to deal with a bird mite issue. The issue was dealt with by pest control, but the teachers were just saying that, upon arrival Wednesday, Thursday, and Friday, they still had concerns – bites and things like that. “Over the weekend pest control came back just to be sure that things were done, they laid down some traps. So what’s happening now is, the health and safety officer Mr. Titus Gordon is looking through to just verify and be another pair or eyes, just to make sure the building is safe. “The teachers did show up to work, but as the Health and Safety Act 1982 says, they felt that the building was deemed unsafe. So they did show up to work; they did not down tools, this did not take industrial action or anything like that. “They did show up to work and they just need verification to be sure their fears can be laid to rest and that the building is safe and ready for everyone to occupy. “The pest control people were secure in what they had to say. One of the gentlemen, his son is a student there, so of course he’s going to make sure that he’s going to do his best, apart from his professional duty, and I’m sure that Mr. Gordon is not going to have a hard time, he won’t find anything that conflicts, but of course we’ll see. We just had to make sure that we had an outside eye to verify everything. “The Minister of Education took time out of his busy schedule to visit; they called an assembly and he said some words to the students. The Commissioner was here and he reassured everyone as he does, and we had a few people from the Ministry here also, the facilities manager and a couple of the area directors. With regard to the problem with birds nests and mites in the roof at Harrington Sound School, I have had an identical problem recently in my own home, and when speaking with an expert on the subject I was informed that in recent weeks, or months, this has been an escalating problem around the Island, with some homes literally infested with mites. It sounds as though every effort was and is being made to deal with the problem at Harrington Sound School. Sssshh. People want to make it political! Please enroll your child in this school immediately!!! Agreed and may I add these issues do not happen over night. Pests can get into any residential or commercial building through the smallest crack or crevice, so who on island can garuantee they are 100 percent pests free. No one can control Mother Nature most you can do is reduce the effects within the confines of the space you occupy. We are not talking about Ebola here. How many of us get bitten by mosquito, does the government put a crop duster plane in the air and spray the entire island.?? No we take our own pre cautions to safe guard ourselves. Many schools have mold. The smell is obvious as soon as you walk into some building. I know some schools were supposed to be tented last summer considering the amount of roaches big and small!! Bird mites may not be harmful but they do bite and cause red lumps that itch. Feral chickens can carry them. Let’s support the department of Environmental Protection who are trying to get rid of them and are often met with push back from the community.